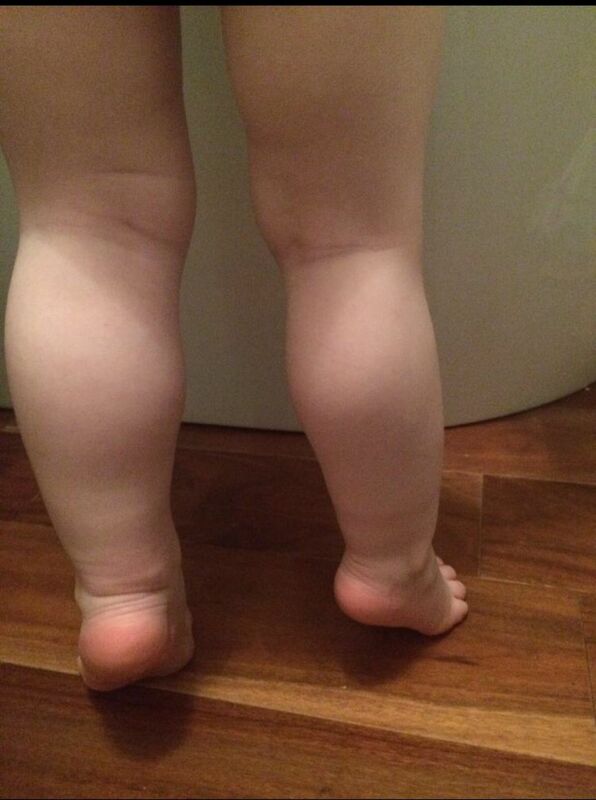 An 8-month-old boy presented with a week’s history of left lower limb swelling. He was apyrexic, well and developmentally age appropriate. He was born at 35+5 via by C-section for breech presentation, weighing 3.47 kg (97th centile). His left calf measured 21.5 cm and the right calf 19.5 cm. The overlying skin showed mild eczema. There was no circulatory compromise of the left leg, and he was systemically well. X-rays of the left tibia and fibula were normal. He received oral antibiotics for presumed cellulitis. A follow-up showed some improvement (figure 1). A subsequent Doppler ultrasound of the left leg was normal. Appearance of both calves at age 10 months. He continued to show size variation of the calf (figure 2). A pit on the helix of left ear and a faded haemangioma over left eyelid were noted. Appearance of both calves at age 15 months. Blood investigations including full blood count, C reactive protein, electrolytes, muscle enzymes (CK), liver, thyroid, bone profile, alpha feto protein and insulin-like growth factor 1 were normal. Abdominal scan was normal. How would you manage the condition? What are the complications associated with this condition?